Robert Pape and James Feldman in Cutting the Fuse: The Explosion of Global Suicide Terrorism and How to Stop It build on Pape’s earlier work, Dying to Win: The Strategic Logic of Suicide Terrorism. This volume is designed to further develop the earlier argument in Dying to Win that the occurrence of suicide terrorism is overwhelmingly explained by a foreign occupation in a particular region, and that ultimately the removal of foreign troops, when possible, will limit the number of suicide terrorist attacks. The book consists of two analytic chapters laying out the basic theories and arguments, eight chapters with valuable case studies (Sri Lanka, Iraq, Afghanistan, Pakistan, Al Qaeda, Lebanon, Israel/Palestine, Chechnya), and a concluding chapter. In the analytical chapters the authors reaffirm what we already know—that suicide terrorism is not uniquely related to religious groups. Those who continue to believe this popular misconception need to be disabused. They also note that suicide attacks are directed against democracies rather than non-democratic states. The eight country studies provide important information for scholars and students and are quite valuable. These chapters are also used to promote the basic idea that suicide terrorism is linked to foreign occupations broadly defined. Review Essay on Robert A Pape and James K. Feldman. 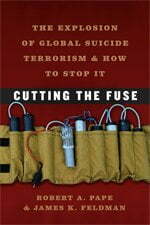 Cutting the Fuse: The Explosion of Global Suicide Terrorism and How to Stop It. Chicago: University of Chicago Press, 2010. ISBN: 9780226645605 (cloth, $30.00); 9780226645650 (paper, $20.00). Cutting a Fuse, not the Fuse! There can be no doubt that Pape and Feldman provide a valuable contribution to the literature on suicide terrorism. It is always important to remember, however, that terrorism is, when all is said and done, a technique. Groups use terrorist violence for a wide variety of political causes—ideological, nationalist, religious, single issue, or some mixture of these motives. Political organizations resort to terrorism when elections, plots, coups d’état, popular uprisings or other more direct means of attaining political objectives are not feasible or have already failed. Terrorism has been and continues to be a weapon that is ideal for asymmetric warfare of the weak against the strong. Just as terrorism is a technique used by many different groups, suicide attacks are one type of terrorism, albeit an extreme form. Suicide terrorism has been emulated by terrorist organizations in many parts of the world because it has worked ( 24). As Pape and Feldman discuss, it is indeed not linked to religious groups, and their case studies demonstrate this fact quite well. Even in the Middle East many suicide bombers are often secular rather than religious, and in the early days the group most active in using suicide attacks was the Tamil Tigers, which has no religious underpinnings ( 22). The fact that suicide attacks usually target democratic governments and their policies is obvious, even if one quibbles about how democratic Vladimir Putin’s Russia is or whether the Sri Lankan state is truly democratic when it attempts to restrict the political and economic rights of a large minority population. It would appear that democratic states are especially vulnerable to suicide attacks because the elected governments are sensitive to public opinion, which reacts quite strongly to suicide attacks that signal both the commitment and desperation of the terrorists. Pape and Feldman further suggest, however, that this particular technique is used almost exclusively in response to foreign occupations. The idea that terrorism only occurs in the context of foreign occupations, and when the occupying country is a democracy, has obvious validity, but there are three concerns about this view that need to be addressed. First, not all foreign occupations lead to suicide terrorism by organizations that practice other forms of terrorism. Second, not all suicide attacks reflect a response to foreign occupations, or they reflect a confluence of issues in which foreign occupation may be the triggering cause but not the main factor. Third, the definition of foreign occupation that the authors use may be excessively broad. One obvious issue is that not all foreign occupations have resulted in suicide campaigns. The Irish and Basque nationalists, for example, were active for long periods, relied on terrorist campaigns, and yet never resorted to such attacks. Suicide attacks have been entirely or largely absent from separatist conflicts in the Philippines, Corsica, Kosovo, or Macedonia among others. Foreign occupation may be a necessary condition in some cases, but it is hardly sufficient. It would appear that other variables come into play in the decision to use suicide terrorism which might include the religious or cultural base of the dissident groups. It would also appear that suicide terrorism is largely a modern phenomenon since past struggles against foreign occupations that involved terrorism—Muslims in Algeria against the French, Greeks against the British in Cyprus, Jewish settlers against British and Arabs in Palestine, the Boxer Rebellion—did not involve suicide attacks. It is likely that the relative success of suicide attacks in recent years, more than foreign occupations, would explain the increase in more modern times. It should be noted, however, that there have been more historical examples of suicide attacks in Aceh against the Dutch and local Christians, the Spanish and local Christians in the Philippines, and Europeans and Hindus in the Indian Malabar coast under successively Portuguese, Dutch, and British rule. These attacks occurred in response to threats to Islam and represented efforts to defend the integrity of local communities against the intrusion of foreign values. The attacks were not directed against the foreign occupation as such, but rather they were challenges to colonial interference in the local Islamic communities. The groups in question sought changes in political policies, not a change in political status. Interestingly enough, the attacks in the Philippines under American rule ceased when it became obvious that the Americans were not seeking to convert the Muslim population to Christianity. This last example would suggest that the underlying cause of the suicide attacks was the depth of religious feeling and not foreign occupation, notwithstanding the presence of a colonial power. These examples would also suggest that the most important cause for modern examples may not always be the presence of a foreigner occupier even when there is one. Although many suicide attacks are directly or indirectly linked to foreign occupations, others are not. Among the more obvious recent examples have been attacks by Sunni Arabs against Shia Arabs in Iraq. These attacks reflect complex internal political issues and controversies. Since the Shia community is generally not pro-American, it is difficult to see how these attacks would constitute a reaction to the foreign occupation (unless the Sunni Arabs see the Shia Arabs as “foreign” occupiers). Some of these attacks are more directly related to struggles for control within Iraq while others may reflect an effort by external actors to create difficulties for a pro-American government (and thus related to a foreign occupation). The same can be said for the rare suicide attacks (as opposed to other types of terrorist violence) in Pakistan that involve the conflict between Sunni and Shia populations. This violence is not related to any foreign occupation. A third example involves the Algerian militants who hijacked an Air France plane in 1994 with the intent of destroying it over Paris or crashing into some landmark. They were not protesting a foreign occupation; rather, they were trying to deter continued French support for the Algerian government. The intention of the suicide attack, aborted when French commandoes recaptured the plane while it was refueling in Marseilles, was to achieve a tactical or instrumental diplomatic or political goal, not to protest a foreign occupation. This criticism of the foreign occupation argument is probably the least important in isolation, but it is important in conjunction with the broad definition of occupation put forward by Pape and Feldman. The third concern is that the idea of foreign occupation has become quite broad. They consider occupation to mean “the exertion of political control over territory by an outside group” ( 20-1). Political control within this context can be almost all-encompassing. African neo-colonial theorists and Latin American dependencia theorists argued that the West dominated their countries indirectly. Such indirect control was not only effective but cheaper than direct control. Had local dissident groups launched suicide attacks against foreign economic interests or their own governments, they might see themselves as fighting against an occupying power. If right-wing extremists in the United States were to launch suicide attacks against the ‘Zionist Occupied Government of the United States,’ they would also be fighting a “foreign occupation.” Pape and Feldman link an upsurge of suicide attacks in the Federally Administered Tribal Areas of Pakistan to the increased presence of army troops, an undoubtedly correct assessment. For Pape and Feldman, the presence of national army units in part of the national territory becomes a “foreign occupation” rather than a domestic political issue. These attacks against the government in the aftermath of the troop presence, however, could represent a reaction to an attempt to increase central political control. The Tamils and Sinhalese shared Sri Lanka for centuries, but when the conflict started, so did the suicide attacks against a “foreign” army. A power struggle among rival ethnic groups became attacks against a foreign occupation. Further, for Pape and Feldman foreign occupation also includes the presence of foreign troops in neighboring states in the region or even more broadly situations in which there is an “imminent threat” of foreign occupation (9). This definition has become so broad as to potentially mean that any suicide attack could be classified as a response to foreign troops present somewhere. The attacks in Morocco in 2007 against a number of obviously Western targets could be broadly considered a response to the presence of Western troops in Arab and Islamic countries. The suicide attack on tourist facilities in Bali in 2005, usually seen as part of the global jihad, however, seemed intended to weaken the Indonesian government and to create pressure to include more Islamic parties in the government rather than to protest the presence of foreign troops in Islamic countries. US involvement in Afghanistan and Iraq provided a propaganda opportunity for local Islamic groups, but they were seeking domestic political advantages. When Baruch Goldstein undertook his attack against Muslims in a mosque in Hebron, he did not expect to survive. In his attack he was protesting the Palestinian presence (foreign occupation complete with Palestinian Authority security forces) in the West Bank and Hebron. Clearly, Goldstein saw his homeland threatened by foreign elements. When all is said and done, foreign occupation or the imminent threat of foreign occupation has been used far too broadly. Foreign occupations, even when more narrowly defined than Pape and Feldman argue, obviously have been linked to an increase in suicide attacks, as they make clear. There is little doubt that a foreign presence is a trigger for violence, including suicide attacks. It foreign troops could be removed in at least some cases, suicide terrorism would undoubtedly decline. When troops are present, they provide an ideal target for a suicide attack because they are clearly outsiders. In some respects, however, the connection that the authors identify could be defined somewhat differently. Suicide attacks occur when the target can be defined as “the other.” Foreigners, including military units, are obviously distinguished from the indigenous population. But the other can include indigenous groups. When a Sunni suicide attacks occurs at a Shia mosque, the attack is intended to kill members of the “other” religious community. When Goldstein went to the mosque in Hebron he was sure he would kill not only Palestinians, but Muslim Palestinians who were more religious and who represented a foreign presence. If foreign troops withdraw from a country—or even a region, but the foreign government continues to support an indigenous government, suicide attacks could continue. Al Qaeda has always considered the United States (and to some extent the West in general) to be the “far enemy” because of support that is given to local governments, “the near enemy,” that are opposed to the values of the Islamic extremists. Just as France was targeted for supporting the Algerian government, the United States will continue to be targeted if it continues to support unacceptable governments, or even if it is perceived to be supporting those governments by what it does—or even does not do. Theories about terrorism and its causes often overreach to some extent by seeking to explain all or virtually all terrorism. Pape and Feldman seek to explain virtually all suicide terrorism by reference to foreign occupation with a definition that could be considered overly broad. In fact the stimulus for suicide terrorism may come more from a foreign presence than from a foreign occupation. The linkage to suicide terrorism comes in the form of the impacts of increased globalization, which can explain much terrorist violence of all kinds when groups react to the penetration of their polities, societies, economies, and cultural systems by external forces. Religious groups oppose secularism or foreign cultures. The left opposes global capitalism. The right attacks foreign migrants and different cultures. Ethnic groups fear assimilation into another culture. The broad definition of foreign occupation (in the region or in neighboring states) implicitly reflects the fear of globalization in its myriad forms. Secular and religious individuals in the Middle East and South Asia, for example, have reacted violently to the intrusion of Western ideas and/or secularism in their area of the world. They are reacting to a foreign presence, not just a foreign occupation. If all foreign troops, security forces, and police were withdrawn from the region, the terrorism would continue. There might be a decline in suicide terrorism, but Western interests would still be targeted in the Middle East and outside areas since Western governments would still be seen as supporting governments that reflected inappropriate values or which were seen as surrogates of Western values or control. Thus, Pape and Feldman’s very useful work must be read and used with a bit of caution and an awareness of additional factors that could not only contribute to suicide terrorism but be more important causes. The presence of foreign troops is important, but other factors obviously influence the decisions of political organizations to adopt suicide attacks as a technique. It is also possible that cultural or religious influences may make some types of organizations more likely to use these tactics. James M. Lutz is Professor of Political Science and Head of the Department of Political Science at Indiana University-Purdue University at Fort Wayne. In addition to other published research, he has co-authored with Brenda J. Lutz Global Terrorism (1st ed. 2004, 2nd ed. 2008), Terrorism: Origins and Evolution (2005), Terrorism in America (2007), and Terrorism: The Basics (2011); co-edited Global Terrorism (2008), a four volume collection of important articles; and co-authored and authored many articles and chapters on various aspects of terrorism. Robert Pape, Dying to Win: The Strategic Logic of Suicide Terrorism (New York: Random House, 2005). Karin Andriolo, “Murder by Suicide: Episodes from Muslim History,” American Anthropologist, Vol. 104, No. 3 (2002), pp. 736-42, and Stephen Frederic Dale, “Religious Suicide in Islamic Asia: Anticolonial Terrorism in India, Indonesia, and the Philippines,” Journal of Conflict Resolution, Vol. 32, No. 1 (1988), pp. 37-59. Dale, “Religious Suicide in Islamic Asia,” p. 49. Dale, “Religious Suicide in Islamic Asia,” p. 54.